Thank you for visiting Misty's Heaven, an informational site about Misty of Chincoteague and her descendants. This site is loaded with lots of pictures and information to make the Misty fan happy! The idea for a Misty family site originated when we realized that there were no websites about the Misty family ponies. We decided to do this site for ourselves, as well as for other Misty fans. This site strives for updated and accurate information on the Misty family line, as well as offering many photographs of the ponies themselves. 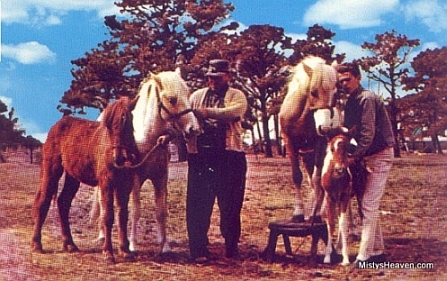 We also feature pictures and information on the real Misty, information on horses and ponies that are related to Misty ponies, galleries of media publicity and memorabilia on Misty and her descendants, the story of the Chincoteague Miniature Pony Farm, and a page on the Chincoteague Pony Drill Team. Our YouTube channel has video of Misty family ponies. Be sure to check our Facebook page and Twitter account for the latest Misty family news and information. If you have any information on any Misty descendant or have information or photos to contribute we would love to hear from you! We love to hear from fellow fans of Misty. Thanks for visiting Misty's Heaven and please come back soon! Misty's Heaven is maintained by Matt and Amanda If you have any questions, comments, contributions, or suggestions, please feel free to email us!